Understanding of process is a key factor in deciding how to work with someone. My internal design team was sometimes asked to engage in a project for which we had no experience in the subject matter, and a tight deadline. In these cases, I brought in external design resources that had designed for the business before. 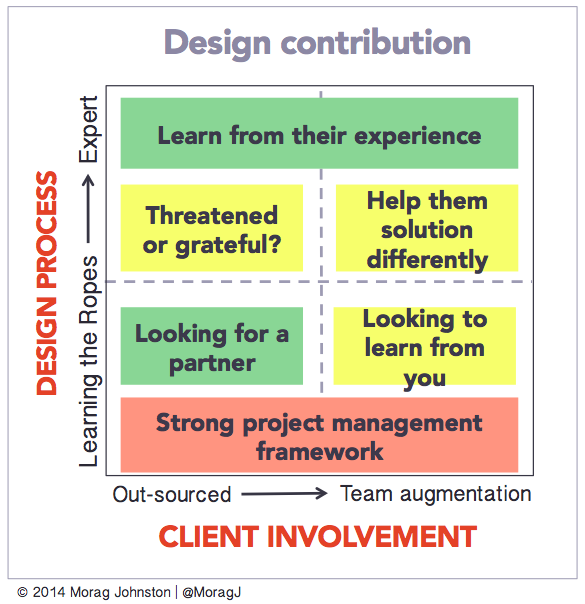 The graph above shows design process mapped against client involvement, and how to treat clients who fall into each quadrant. WHAT TO DO: When someone understands design process well, and has applied it within their own organization, take the opportunity to learn from the client’s experience in working in this environment to minimize the project risk profile. They have likely already made all the mistakes you could ever make. If they want this project to go well they will happily share everything they know. The trick is, they may not realize everything they know. Your job is to ask questions that reveal that tacit knowledge. At the same time, expose them to new ways of creating solutions that address or prevent some of the identified risks. Expect that the client’s design team will want to learn from you. There aren’t set ways of dealing with this scenario. There are hidden shoals that could scupper the project. No doubt you have been told that the client has no design resources to assign to the project. If they don’t have a design team, at least the client recognizes that they need one on the project. They have a design team, but it is tapped out. The design team may have standards to be applied or need to approve your work. Ignore them at your peril. Provide them with lots of warning as to when your deliverables need approval. They have a design team with resources available, but “someone” decided that the team wasn’t competent to do the work and excluded them from the process entirely. Check with your client as to whether there are design guidelines to follow. If you are truly paranoid, do a back-channel check to make sure they the design team really can and should be excluded. Make sympathetic noises when conversing with anyone from the design team. (Heartless to say, but) If they do not have enough power to ensure their inclusion, they probably can’t affect your work. The client has no digital design team. Your client may not know what they don’t know. They are in the first and “unconscious incompetence” stage of the learning curve. (http://www.businessballs.com/consciouscompetencelearningmodel.htm) Dangerously, this will likely mean that they will overestimate their capabilities. These clients generate the majority of the “client from hell” stories. They may know that they don’t know what they’re doing; they are “consciously incompetent”. Whether you give them direct instruction or indirect guidance will depend on their vulnerability quotient. There may be many change requests in the form of feature additions and scope changes. The timeline will likely be blown. Look out for the Web Developer Who Has Always Done This In The Past to pop up and need to be involved; this person will understand software development, but not necessarily design methodologies. Find out early from your Client and manage/educate them according to their Personal Involvement quotient. WHAT TO DO: Employ a really strong project manager who is excellent at setting and managing expectations. Add extra budget for client education, or treat it as an investment in the relationship. Have the conversation with your client to determine what they are looking for from you. Explore a future relationship only if they are interested in learning the design process. At best, this client is looking for an ongoing partner for Digital Design work. WHAT TO DO: Explore that potential only if they are interested in learning enough about the design process to truly be a partner and value design work. Otherwise, your design timeline and quality could be compromised.